Hinamatsuri poster. Hina dolls illustration from fumira.jp. Hinamatsuri (ひなまつり), or Girls Day, is just around the corner (it is always on March 3rd!). We can’t afford a nice Hina Ningyou/Dolls set (nor do we have room for one), so I designed and printed up an 8×10″ poster to display in our living room to remind us of this Japanese holiday. I just googled “free Hinamatsuri image”, then added text to my favorite image using Picmonkey.com to create my poster. You could also do the same thing using Photoshop. 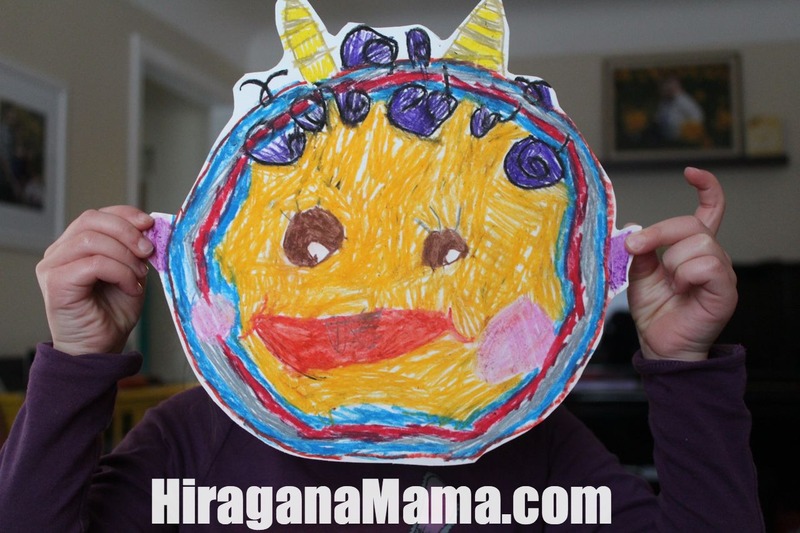 I’ve blogged about Hinamatsuri activities to do with your children many times in the past. Click HERE for all my past posts about Hinamatsuri/Girls Day. 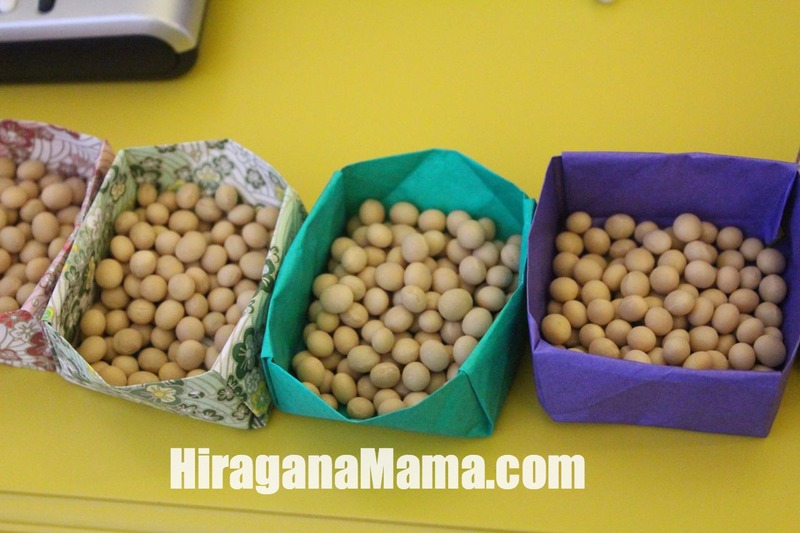 I’ve also been pinning cute Hinamatsuri ideas on Pinterest. Click HERE to view my Hinamatsuri Pinterest page! I hope those links will help get you prepared to celebrate this popular holiday. What will you be doing to celebrate? Oh my goodness, last week was so busy I barely had time to breathe! I meant to put up this post last week but…. obviously I never got around to it. Anyway, the week leading up to Setsubun was a lot of fun. We began by drawing and coloring oni faces using oil pastels. 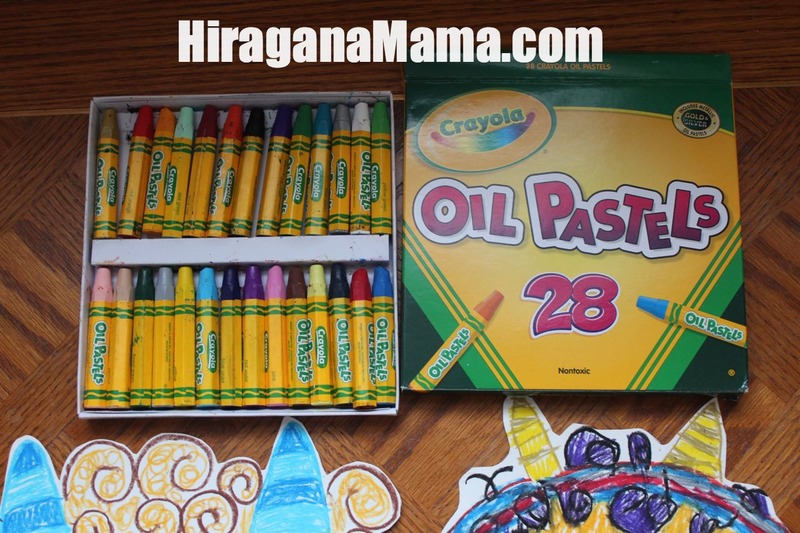 Oil pastel crayons are the coloring material of choice at preschools in Japan. I love them too because the colors are bright and the color slides effortlessly onto the paper (only downside is that it’s not very washable… parental supervision is important for young kids). To draw your own oni, begin by drawing the outline of the face. Then add horns, or “tsuno”. In Japanese cartoons, ogres usually have yellow, striped horns. Then add some curly hair and other facial features. I love how creative my daughter was with her oni. 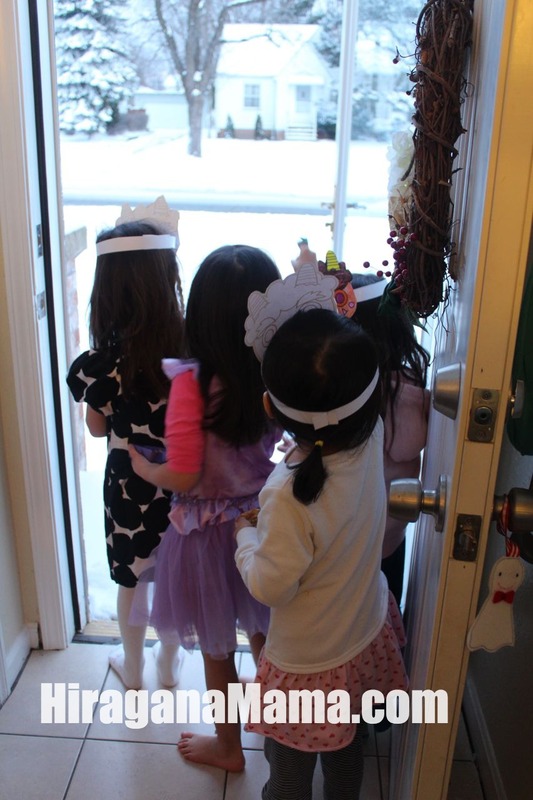 We invited some friends over for a Setsubun Playdate. 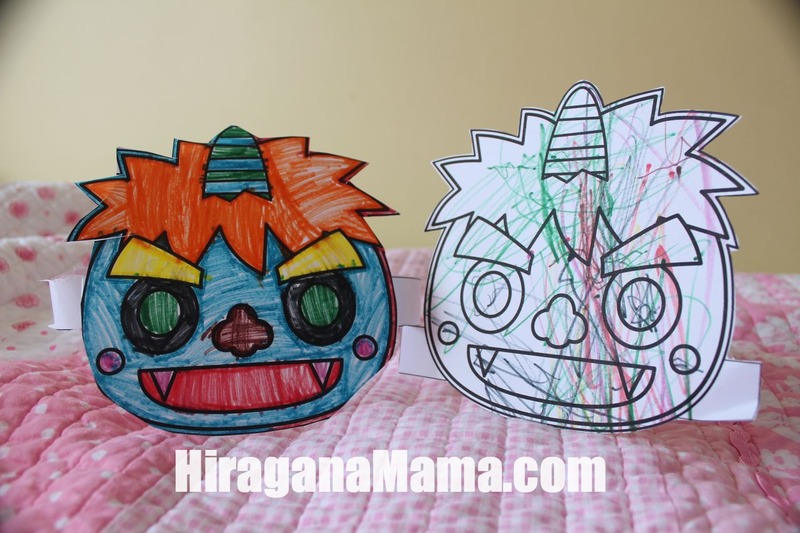 The children colored oni masks that I printed onto cardstock from KF Studio. We then made boxes to hold our beans out of origami paper. I didn’t want to be cleaning up beans in my house to I had the children toss their beans out the door, saying “Oni wa soto! Fuku wa uchi!”. We finished the playdate by making maki-sushi and eating them facing the lucky direction of the year. My daughter also learned about Setsubun at her Japanese preschool. They made these cute oni boxes using a milk carton and construction paper. Can you tell my daughter turned her oni into a princess? 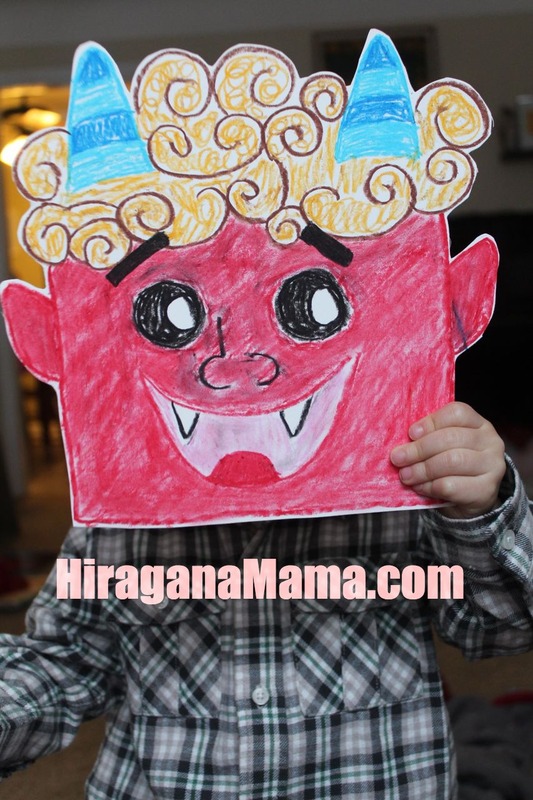 Did you do anything to celebrate Setsubun this year? What’s the next Japanese holiday you are looking forward to? There’s only one week left until Setsubun(せつぶん/節分)! 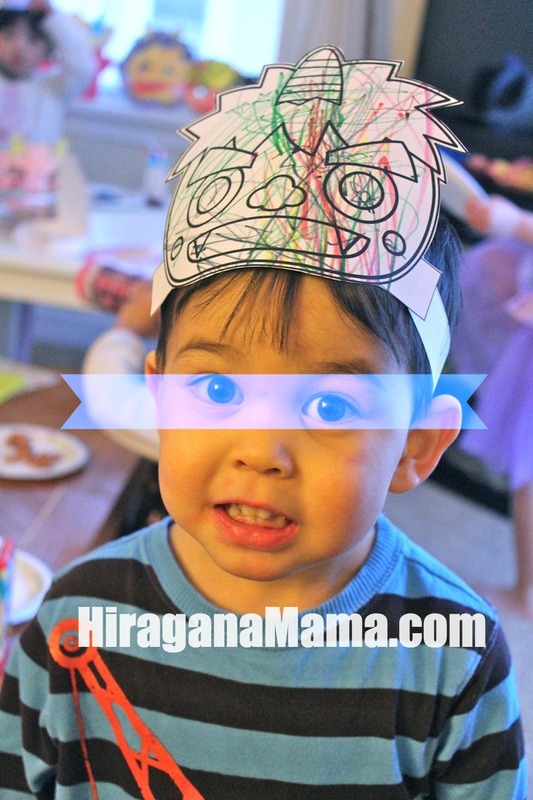 Do you have your supplies ready to celebrate this fun Japanese holiday with your children? (Unfamilar with Setsubun? You can read about it HERE, and see my past posts about it HERE, HERE, and HERE). Setsubun is next Sunday, February 3rd. – dried beans (traditionally roasted soy beans, but you can also use peanuts, marshmallows, candy, etc). – Designate one person to wear the oni mask. – Everyone eats their age+1 in beans, for good luck. Just Bento has a great Ehou-maki recipe HERE. – Facing the lucky direction of the year (in 2013 it is south-south-east), eat your entire ehoumaki (futomaki) in complete silence. – Fold an Oni and Fuku out of origami. Below is a great tutorial by Daily Origami. If it looks too advanced, click HERE for other options). Read more about Setsubun (in Japanese) HERE. Today we worked on making homemade oni masks. Tutorial coming soon! あけましておめでとうございます！How did you spend your New Years? My children and I ate mochi, played karuta, and watched a little bit of 紅白歌合戦 (Kouhaku Uta Gassen). One of my daughter’s first homework assignments from Japanese School this year is to complete a worksheet about the 十二支／じゅうにし(Jyuunishi). This is something that I’ve never thought to teach her and something I don’t know too much about either. So of course I used the internet to look for the best resources to teach my daughter about the Jyuunishi. If you don’t have an iPod/iPad, you can visit Xuite’s website to listen to the story of the jyunishi (in Japanese) then print off the provided worksheet to complete. Then I will help my kids figure out what animal year they were born in, and read to them their “personality traits”. You can find those HERE and HERE (this website has a fun animal-matching flash game at the bottom). Then, I will teach them that 2013 is the year of the SNAKE(へび). We might color one of the snake coloring pages by happylilac.net. My daughter made paper plate snakes (instructions HERE at “Crafts and Art for Children) at Japanese School. If you have any other ideas, please share! (You can read more about Jyuunishi on Wikipedia, HERE. It is basically the same thing as the Chinese Zodiac Calendar). What are you/your kids going to be for Halloween this year? My kids are dressing up as the Little Mermaid and Spiderman. They are super cute! I was also thinking that, to be unique, it would be fun to dress up as something inspired by Japan for another Halloween. Here are some things/characters that I thought of that would make great costumes! Do you have any more ideas? Click HERE, HERE, or HERE for my previous posts about Halloween in Japan. Happy Mother’s Day weekend (haha no hi), everyone. Whether you are a mother or not, I hope it is a wonderful weekend. I will be reflecting on my past few years as a mother and how much my heart has grown with the addition of my two little ones. The flower associated with Mother’s Day in Japan is the carnation. 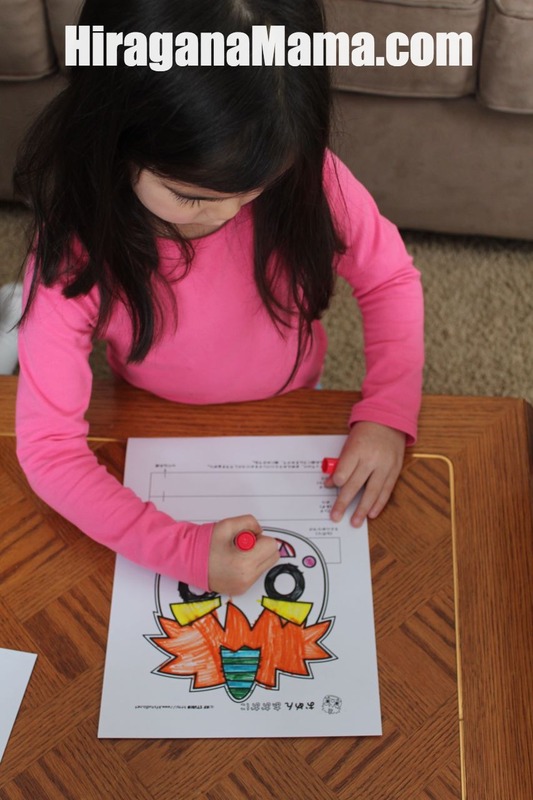 For Japanese Mother’s Day coloring pages and printable coupons, click here.